Those who caused the problem are not the same as those who will carry the burden. The more indirect the relation between their actions and the consequences, the lower the motivation to do something about it (consider e.g. the time lag between smoking and its health effects). If someone causes a problem without having to bear the consequences themselves, their motivation to solve it becomes even smaller. If those that are adversely affected can’t even hold you to account (e.g. because they aren’t born yet), it becomes tempting to not be bothered by the impending problem, even if you’re contributing to its cause. Note that the difference between strong emission reductions and fossil intensive becomes noticeable only after 3 decades or so: There are long time lags in the climate system. 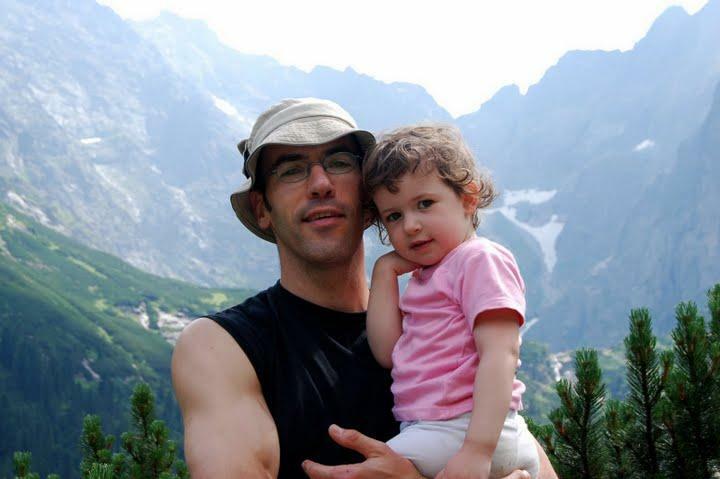 Me and my daughter in the Polish Tatra mountains. Figure above from Meinshausen et al., Nature 2009. This entry was posted on September 6, 2010 at 21:16 and is filed under English, musing. You can follow any responses to this entry through the RSS 2.0 feed. You can leave a response, or trackback from your own site. I agree with a part of your reasoning for the 100%. The solution is simple: go nuclear, massively. No other technology will ever allow us to make the bend in the predictions as you show in this figure. In France 80% of the electricity is from nuclear, 5% from hydro. Children are the most valuable contributions to ones life. Your daughter will probably be twice as rich as you and your grandchildren four times as rich as you, so they an easily clean up your mess. The forgotten bit in all disaster scenarios is that the people in 2100 will be extremely rich and will smile at our problems, like we are smiling at the “problems” of 1900. I’m not so sure that this reasoning is sound. Firstly, sure we might be “twice as rich” as our parents were but does it mean we can “clean up their mess” twice as easily? I’m thinking about what was accomplished 30-40 years ago in terms of large-scale engineering – moon landing, nuclear power stations, large dams, highways. Can we really do it twice as easily? I think that much of the increase in wealth (GDP) is not really relevant when it comes to actually doing things that might help. Having iPhones or high-speed internet isn’t much help in geoengineering, you need actual machines, dirt, chemicals, energy. Secondly, if we continue increasing our emissions exponentially (as we seem to be doing, and as is implied by a strategy of not actively countering that trend) then even if our children are twice as rich, the problem will likely be twice as hard to solve then as it is now. Thirdly, the assumption of continued exponential growth into the distant future is highly problematic on a finite world. We’ve gone through about 10 doublings since industrialisation started, and practically all of this was based on exponentially increasing consumption of fossil fuel. If we’re going to double again in the next 30 years we’d better get cracking on implementing a bigger energy source – fossil fuels ain’t got any more doublings left. If you’re hoping that the economy will grow unrelated to energy use (ie increased efficiency) then you’re still back at the first point – actually doing stuff in the world does require actual energy and resources. Even if “being rich” can be decoupled from physical constraints, the physical requirements of actually “doing something” to clean up the mess ensure that any such cleaning up has to operate within a physically-constrained part of the economy. Another analogy can be used: Who takes better care of their home? An owner or a renter? There are approx 50,000 active coal plants that produce approx 30% of the worlds emissions today. The world population is heading to 10 billion so we will need to produce a lot more electricity in the future – especially if EVs start to become common. But lets assume all new capacity is non-emitting and we want to close all of these plants by 2050. That would mean that we will have to install 3.4 coal plant equivalents (500MW) PER DAY every DAY for the next 40 years. Wind has a duty cycle of 20% at best so if we used wind we would need to install 4280 2M turbines each DAY – every DAY for the next 40 years. The rational conclusion is a 50% reduce is NOT going to happen by 2050 and we will be likely if we can even stabilize emissions. That makes what if scenarios like this completely irrelevant. Nice to see you, and yes, the little one is a sweetie. As for your reasoning. I wonder how much of the increase in GHGs can be attributed to baby boomers…? The reason I state that is because in my experience it is they ( as a whole/collectively) who are very reluctant to take action on the ACC file, and they (regrettably) still have a disproportionate amount of political clout. So much for inter generational equity and global stewardship…. We all have a hand in this problem of course; I wonder what generation X and other younger generations feel about taking aggressive (and potentially painful action). The social/psychological part of this problem has not received sufficient attention, but then again, I do not read social science journals…. “Twice as rich”? I don’t know about Europe, but here in the States the idea that the next generation will be better off financially that its parents, much less ‘twice as rich’ has faded rather markedly — and the economic metrics support that, indicating that middle class wages have stagnated for decades (the main countervailing forces being government jobs, not private sector, and the massive entry of women into the job market starting in the 70s, which boosted household incomes the last time they were stagnating — something which basically run its course can’t be rely on again, obviously. The middle class reponse to the current decade of stagnating incomes has been to go heavily into personal debt.). Those in the top 1% of income have of course seen a MUCH different perspective on the last 30 years. Religious beliefs like Harry’s are rather too common, and a big part of the problem. Unfortunately he won’t be around to smell the roses (or even to be told “I told you so!”). Where does my religious belief come from??? As for nuclear, do the math. TimG has started with it. Windmills and solar are far out of reach, especially since they are not able to provide power 24/7/365. I am currently designing an electronic system to charge 4 AA batteries with solar cells. I can guarantee you that it is not that simple to keep the cells powered during all weather situations. Solar yield is OK in top luminosity, but rapidly decreases when clouds come into action. It is far from trivial. TimG – these sound like big numbers, but so is current construction of big things – the world already builds a new power station every 2-3 days, dozens of oil wells every day, not to mention 1000s of trucks and 100,000+ cars every day. Look it up. 3 million tons of steel, 8 million tons of cement. Every day. Big numbers. Also, remember that many of those 50,000 power stations (and many thousands of oil wells) will be replaced or upgraded anyway in the next 40 years (and if the world’s consumption of energy increases as projected by continuing economic growth, we’ll need to build new infrastructure for all the increase as well). And as for that other big CO2 emitting industry, virtually all the billion cars presently driving around will be replaced at least once over the next 4 decades (not to mention the additional cars for all the projected new drivers in developing countries). So, yes, big numbers are necessary. But big numbers exist anyway when you look at global production. Especially when projected into a future of exponential growth. The big question is whether those big production numbers will be of coal and oil powered equipment or something else. My vote is for something else. Not just for climate change reasons. A new power station every 2-3 days is still 10 times slower than the rate of 3.4/day which would be required to replace the existing ones. You also have to add the need to build new ones. The required rate of construction is simply not plausible given history. Especially when you consider there is zero economic rational for replacing these plants with more expensive alternatives which means they would need to be financed by taxing other people’s productive work. The bottom line is emissions are not going to go down by 2050 even if some new technology is found because an existing infrastructure was built over 100 years and it is not going to be replaced in 40. I have to think of another thing to plot with that graph, namely a proxy for the amount of effort the world is willing to make. That graph would look just like the one you put up, except that in the low emission scenario it’s the effort that rises exponentially rather than emissions, while in the high emissions scenario the level of effort the world is willing to go to tails off, while emissions and temperatures rise exponentially. This is a somewhat different view than the action/inaction dichotomy, in which the proxy for effort is 0 until we take the decision to take action, at which point said proxy goes to 100% of what’s necessary. What’s a reasonable proxy? Maybe willingness to spend as a fraction of global GDP, and I figure this is currently something between 0.1 to 0.5% of global GDP, with some countries it’s close to 0, with the US or China it’s probably closer to 0.1 or 0.2% and with Germany or the Netherlands maybe it’s between 0.5% and 1%. Now I think that this willingness to make an effort is also a variable that’s going to react quite slowly. So, I figure it’s likely that the world will be a little more willing to put an effort into combatting climate change in 2015 than at present, and bending this line upwards or downwards through advocacy is itself going to be a slow business. What I am wondering about is. If we assume that the level of overall effort the world is willing to go to is a fixed variable, short term at least, how much difference in effectiveness is there between alternatives with the same level of required effort? This is similar to the Pielke and Lomborg lines, respectively (Pielke: targets have yielded little, so try something different, ie throw money at research; Lomborg: we need to spend money effectively, so throw it at research). The counter-argument I frequently hear to this is, throwing money at research is risky, because it might yield little, and in the mean time emissions are rising. This counter-argument implies there’s a real choice to spend enough to arrest emissions rises in the near term. When the actual looks more like, we’ve got a few hundred billion to spend, which if spent on emissions reduction alone will only slightly slow the near term rise, and have little long term effect, and to have a big effect on actual near term emissions we’d need to be willing to spend trillions now. Which patently the world is not willing to do and is unlikely to any time soon. So, instead to square the circle, politicians come up with targets and emissions trading schemes that appear to have a big near term impact on emissions, but where cost containment loopholes have the effect of rendering the targets meaningless, and thereby keeping the level of effort asked of the population to what they are actually willing to bear. The risk of that sort of strategy at the expense of research is that it neither yields much near term emissions reduction, nor much in terms of long term technology gains. While an interesting suggestion, the %spent is just one part of the effort. There are a number of ‘efforts’ that can even save money, but require a change of habits by individuals, and are ‘therefore’ hard to get through. Check those that save money, and then ask yourself: why aren’t ‘we’ doing that? Each element individually may not do much, but combined you get many % reduction (I’m guesstimating 10% at least) AND you save money. The “we don’t do it because it costs money” argument simply does not hold (not saying you have that position! ), we must take into account the difficulty of individuals to change. We may thus have more expensive changes that people are more willing to accept, because it does not require them to change their behavior (much). The ‘changes’ are a drop in the bucket. In some cases, (such as the local food obsession), the actions will actually help increase global emissions by encouraging less optimal land use. At some point people are right to say that if it makes no difference and saves me no money they why should I do it? TimG: they are NOT a drop in the bucket. We’re easily talking 10-20% reductions in a rich country like the US. The problem is that it must be a concerted effort. Moreover, you over’simplify’ the local food issue. Allow me to give an example: Dutch pigs are brought, by truck, to (southern) Italy, a trip of over 800 miles. There they are slaughtered and made into ham and packaged, and part of that is then shipped back to the Netherlands to be sold. Are there no slaughterhouses in the Netherlands? Sure there are. Plenty even, but then the ham can’t be called prosciutto and sold for x-euros more. Similar movement across Europe is observed for sheep and horses and donkeys, and the subsequent products. Tomatoes, plenty of those in the Netherlands and Spain, are moved between the two countries, with Dutch tomatoes swamping the Spanish market, and Spanish tomatoes sold in Dutch supermarkets…many more examples are abundant, and not just related to food products. Regarding the “makes no difference”: not plugging one hole when you have the chance because there are other holes growing (which you don’t do anything about either) is outright naive. Plugging the one hole actually DOES make a difference: at the very least you reduce the growth rate. There’s also the issue of ‘setting an example’: many developing countries copy consumer behavior of the developed countries. If the developed world focuses on, e.g., low-energy bulbs, production is focused on those bulbs, and the developing world much more likely to also adopt those bulbs. Then the “saves me no money”: I already made it clear that many people don’t change our behavior *even if it DOES save money*. I know several people who take the car to get a few batteries (or whatever) in the shop less than a mile down the road. They often own bikes, also, or can easily borrow one from their neighbour. They know this, and yet they take their car…plenty more of such examples, too, if you’re interested. 10-20% reductions of what? Total CO2 emissions? Not a chance. Depending on the house you might be able to reduce your home electricity consumption by that much but a lot of people have already done the easy stuff. The remaining items like replacing insulation can cost a lot of money which means they don’t get done. As for materials being carted around: get over it. We are wealthy today because we specialize. That means it makes more economic sense to ship pigs hundreds of miles to a slaughterhouse near the processing factory than to have hundreds of small local ones and there is no reason to believe the energy consumed by hundreds of local plants would be less than the energy consumed by one large central plant. If fact, experience suggest the central plant will use less energy even if one takes into account transport costs. As for people choosing to spend pennies to save time: get over it. Time is money and if driving to the corner store saves them time then the cost is worth it and it will likely continue to be worth it even if the cost of fuel was much higher. That is the problem with a lot of these energy saving schemes is they reduce energy by requiring more human labour. What this means is these schemes are only useful to people who have like to do the kind of labour required and have the time to do it. Good points Marco. But I strongly suspect that someone is not open to changing their mind. Fortunately, most people are open to new ideas and changing, they just need some encouragement. I would add more, but again, we are way off topic. Anyhow, fascinating to watch those goal posts move. No it is not warming. To, yes it is warming but it is not us. To, yes it is warming and we are mostly responsible, but the consequences of any warming won’t be bad or the climate sensitivity is low. To, yes it is warming and we are mostly responsible and the consequences of warming may be bad but we can adapt. To, yes it is warming, we are mostly responsible, the consequences from warming may be bad, but we cannot afford to address this issue now and besides nothing will work or make a difference anyhow so why bother. Voila. You know as well as I do that the reason for taking live pigs to Italy and return the prosciotto cotto or Jambon de Parma is purely a beaurocratic rule of the EC: you can not produce Prosciotta cotta, Parma ham outside of their established tradional regions, although the technology may exist in the Netherlands to do so. In short, regulation is wasting energy and producing CO2. These are the easy, low hanging fruits. Harvest them. And the lesson to be learnt: kick out of office those useless beaurocrats. You will save a lot of CO2 in the process. Could you provide us with examples of the things /measures you have taken personally for your household to reduce your carbon footprint, so we ingnoranti can share in your 10 to 20% easy gain? You may have to deal with moving posts. I do not. My single goal is to have my life and that of my family at my conditions. But I am just looking at the things I have to take care of in order to prevent excessive taxation due to energy consumption. My goal is to minimize the costs, using the regulations, taxations and whatever I can find to get any profit from. I explore every rule, law and subsidy. There is so much free money floating around, it is ridiculous. Having a technological background, as I have, does serve to a large benefit. Beaurocrats do not have the foggyiest idea of technological possibilities. That is why most legislation is crap and easily circumvented/twisted by the technologically savvy. I assume you are aware that every low energy CFl bulb contains at least 1 mg of mercury? And after its lifetime of 2000 to 8000h, this mercury is likely to end up in the environment, due to the lack of strict return policies? I prefer to have more CO2 above mercury. They are based on GaAsInAl alloys. Some are based on SiN3 alloys. Three of these constituents are extremely toxic. Rat poison is based on the chemicals in the leds category. The lifetime of Led lightings is still under debate, but the influence of the electronics used to drive the leds has a very serious and negative influence on the led lifetime. I can show pictures of led lights that could have initiated a fatal burn down of my house, just due to bad engineering ( they selected a rectifier which was not up to the load it might engage during start up). Silly errors, easily prevented, but nobody did. And what is your drive? Illuminate me on that. And please go so far that you explain what you are doing for the keeping of the planet. Explain, please, so that my children know that you are caring for the future of my children. I am much more green than you can achieve in a lifetime. I am curiously awaiting your report. Show me wrong. Eli has disqualified himself. He is not green. He thinks living in a block of houses makes him exempt of taking isolation measures. Or maybe not. Perhaps all of your “greening” efforts will be undone by the collective actions of those who reject the notion that AGW is a problem, as you apparently do. In that case, I would say that you failed to do your part after all. Your ‘moving goalposts’ talking point presumes that all sceptics believe the same same thing. This is not true. The ones that believe CO2 has no effect on climate still believe that. They ones who believe the effect is there but is grossly exagerrated still believe that. And the ones who accept the IPCC science but reject mitigation policy still believe that. Nobody is moving any goalposts. That said, the number of people in the latter two groups is increasing because a lot of former AGW believers are becoming sceptical. Experts at the International Energy Agency (IEA) in Paris estimate that demand for coal will increase in the next two decades by more than for any other energy source except wind and solar power, from the current level of about 6.7 billion tons per year to almost 10 billion tons in 2030. Back to Bart’s point. Even if we accept that things are going to be bad, that doesn’t give us license to throw our hands in the air and say well, we might as well make it worse or unbelievable. The EU and the US currently have about the same standard of living, but US emissions are roughly double that of the EU. There’s a lot, a huge quantity, of low hanging fruit there for the taking. And never forget the value of example and pace-setting. If the US changes its practices, other countries will follow. And that goes for other advanced countries too. If we can’t make it to the blue line, we could at least try to ensure we’re on the low side of the red line. Another thread illustrating how many of those concerned about climate prefer winning an argument over achieving their goal. Here we have Harry, who without even trying, has a low, low carbon footprint. He’s a cheapskate, so he does it for his economic benefit and his family’s well being. He is speeding energy transformation, the goal. Why does Pat belittle this exemplary lifestyle? Pat should ask, “How are you able to do this, and how can others do the same? Rather, he prefers to argue about AGW. It is rediculous to expect a truck driver to have the same carbon emissions as a hair stylist because the nature of the truck driver’s work requires the burning of fuel. The same issue exists with countries because each country has a different mix of industry – some of which require more emissions than others. On top of that geography, climate and population density differ between countries and this will lead to differences between countries. This means there are no ‘low handing fruits’ when it comes to reducing US emissions. Any move will require significant sacrifice on the part of some or all of the population. The analogy is good. It could be better if it were thought of in terms other than C02 emissions. Attacking black soot is a mitigation that is possible today, politically and technically. 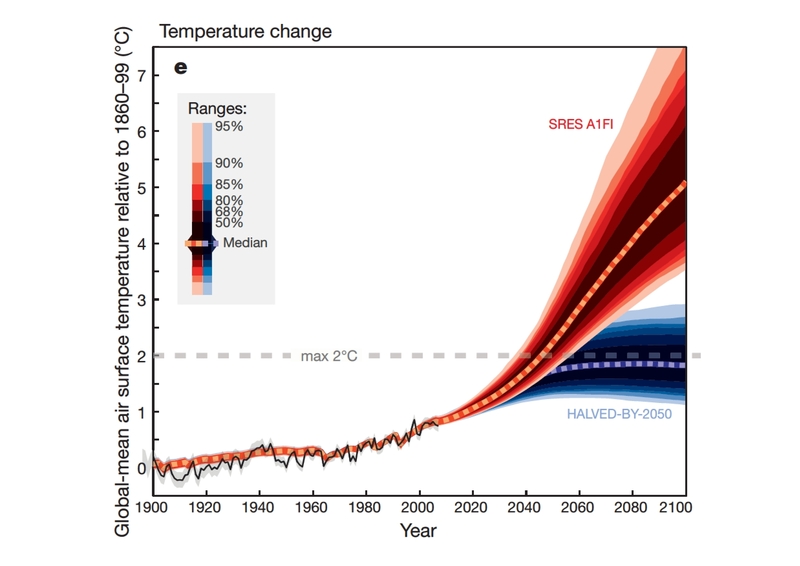 The consensus seems to be that all must be done to prevent a greater than 2C warming in this century. Right now, and perhaps not soon or ever, the national and international agreement required for the CO2 approach does not exist. If we cannot directly suppress CO2, can we prevent 2C warming? Certainly. There is a lot of low hanging fruit. While much about climate change is contentious, there is broad agreement on the need to speed fossil fuel replacement. Many good ideas about how to do that come from climate contrarians and even deniers. According to several independent sources including the UN, the average income (not GDP) in the US in 2050 will be $88,000 in inflation adjusted dollars. Individual figures for other developed countries vary, but are at the same order of magnitude. China’s income (not GDP) will skyrocket from about $1,600 to about $23,000 over the same period. So Bart, your lovely daughter will be able to help your academic retirement, but she won’t be Bill Gates. And her Chinese counterpart will be excitedly using the electronic tool kit that her parents couldn’t quite afford, and driving a decent car. At 2050 the picture looks pretty difficult from a green point of view. We will be using massive amounts of energy, and most in the developing world will not care overly much how it is generated. But then it starts to get better–and quickly. China’s population will start to decline, as will that of 48 other countries (mostly in Europe). The elderly population that will be so prominent everywhere will use less energy than they did when economically hyperactive. Those still working will get proportionally higher incomes, as GDP gets spread among fewer workers. And their children will be born and educated in much the same way as your daughter. And they will care. And they will have enough money to mitigate and adapt. We should do all we can now, whether at an individual level (I quit driving as my ‘grand green gesture’ 20 years ago), a group level (I am trying to persuade our landlord to get solar panels) or through political means. The future needs our help. But we don’t have to sweat bullets and imagine catastrophe. We do the footwork and prepare the field, lower our emissions as and when we can, and if we do an honest, workmanlike job of it, things will be okay. Your comments about solar didn’t mention solar thermal, also called CSP concentrating solar power. CSP, when combined with molten salt heat storage can provide power day and night. Parabolic trough type CSP plants can have capacity factors of 50% and power tower plants can have capacity factors of over 70%. These are usually at least 100 MW, and up to 1GW or more in size. The power they put out is steady, essentially base load, but even better in some respects. It is dispatchable power that can follow the load. This makes it easier to intergrate intermittent sources, like wind and PV solar, into the grid. The potential of Arizona alone is 285 GW, using a small percentage of the land. New Mexico has 221 GW, California 98 GW, and so on. These plants need really sunny areas to be efficient. Plants can put out power form heat they stored as much as two days ago. And it is about 100 times cheaper to store heat, than it is to store electricity. There are six states with huge solar potential. California, Arizona, New Mexico, Utah, Nevada, West Texas. Colorado, Oregon, Idaho, Kansas has decent potential. There is about 1000 GW potential for solar thermal in these states. Combined with solar PV and wind much more can be done than you project. Wind power grew by 18.2 GW in the last two years. (2008 & 2009) in the U.S. With a capacity factor of 25% you get about 4.5 GW of 24/7 power. Thats the equivalent of at least 4.5 nuclear reactors. How many of those have been built in the last two years? China is planning to have 100 GW wind power by 2010. They are spending $454 billion over the next five years boosting renewables. And there are already cfl’s where they have reduced the release of mercury to almost zero, even if they break. First of all, I pointed to the US situation, where 10-20% gain at a monetary gain is easy. Second, my carbon footprint is low mostly because I bike to work every day it is safe (we sometimes get heavy loads of snow in winter, which the cleaning crews in some areas don’t remove from the bike lines…idiots). A bit of smart buying of equipment, not using standby modes, switching off lights when they are not needed, washing as much as possible with a full load, using a drying line, washing dishes by hand, etc. etc. has reduced our energy use to 75% of the average household. TimG: you claim most people have already done the easy stuff. This is simply not true, in particular in the US. By far the most people in the US still use a dryer, rather than a drying line. I’ve seen so many cases where three t-shirts and a few shorts were in the washing machine. Dishwashers running half-empty. When I was invited in a small town in California to go eat, we went into a car, drove 1 miles to a restaurant, only for me to notice it was a mere 0.5 miles from the home of these people; a ten minute walk! They did that every single Friday. I know American life is for the most part simply not geared at NOT using the car to do whatever needs to be done, but this was nuts. Not to speak of the vortex in the fueltank most of those cars create (20 mpg was huge, apparently). Regarding my example of prosciutto: as Harry also indicates, it has nothing to do with this being more efficient, but with bureaucratic rules and people being so stupid paying for a name (we have ‘feta’ cheese which only lacks the ‘feta’ name, because it is not allowed to be called so. And people still buy the stuff carrying the ‘feta’ name, because “that’s real feta cheese!”, and the other stuff is not). There are many such examples, with horses moved from Eastern-Europe to Italy to be slaughtered, because the average Italian doesn’t mind eating horse meat…but does mind using Italian horses for the slaughter). There will be cases where looking at the whole life cycle means that using local produced food is actually worse, from a CO2 perspective (not that your link adds other issues), but there are so many examples where that simply is not true. I will concede that bureaucracies may be the source of the problem in your example rather than economics, however, it also demonstrates the dangers of letting bureaucrats regulate carbon emissions and is a stronger argument for keeping such power out of their hands. Your example of the drying line again proves my point: many of these conservation measures seek to increase the amount of labour that people do in order to save energy. It is unreasonable to expect anyone to volunteer to spend more time/effort on a task than they need to if they can afford the price of energy that makes that task go away. The only savings that are truly ‘free’ are the ones that require no significant capital outlay and no additional labour to implement. There are not many of those, however, changing bulbs is one of them and many people have made the switch voluntarily. I will also concede that some types of local farming are a net benefit and things need to be evaluated on a case by case basis. Unfortunately, the public message presented by environmentalists does not allow for such nuances and seeks to demonize all transport of food when transport of food of long distances is an essential part of the food security we enjoy today. I was grappling with the same point, effort is not purely monetary. There’s more to effort than that. What’s difficult is to quantify these other dimensions of effort neatly, which we must to properly put it into a graph. Where I have difficulties with Lomborg at the moment is that I feel he’s far too glib in giving numbers to illustrate why one measure is supposedly thousands of times more efficient than another. These comparisons are all based on heaps of assumptions. On the other hand, I think it’s also a bit too easy not to even try to quantify efficiency/effectiveness of policy measures at all. Or to dismiss more targeted technology funding (like ethanol mandates or feed-in tariffs) by claiming that a cap of 20% below today’s level together with a price containment provision of 20 Euros per tonne is going to work, because emissions reductions are cheap and in so far as they are not the market is going to stimulate innovation enough through that carbon price incentive. I am quite partial to the argumentation that says that 20 Euros per tonne is too little for much technology development to be advanced, and that cheap usually means low capital expenditure, minor tinkering that’s easily reversible, the type of stuff where companies decide to temporarily use a bit more natural gas gas rather than coal, or people decide to turn down the heating a bit. The best way to roll out new technology is when an old asset is needs to be replaced. In this scenario the capital cost only needs to be comparable to the fossil fuel alternative. Governments can nudge people in certain directions with regulations that restrict the technologies that must be used for new assets but they cannot go too far because if they increase the cost of a new asset too much people will choose not to invest the capital at all which will harm the economy in the long run. The trouble with the technology we have now is the full cost of renewables (including any backup power required) is at least double the cost of the fossil fuel equivalent. This differential cannot be closed with a carbon tax because that kind of increase would result in reduced investment in capital assets and great harm to the economy. R&D and sensible government regulation could help close this gap. For example, nuclear is cost competitive with coal in places like South Carolina because it costs a lot of money to transport coal. The only problem is the cumbersome US regulatory process makes it almost impossible to build a nuclear plant in a reasonable period of time. Japan does not have this problem and can build new a plant in 4 years. If the US could emulate Japan when it comes to nuclear regulation it could replace many coal plants with non-emitting nuclear. The same could be true of thermal solar in places like california and arizona where projects are held up because of various local lobby groups. Great, “ssek to increase”? It may be a consequence, but “seek to” is putting a motivation where there is none. At best what you show, and what I already indicated many times, is that it is hard for people to change their habits (using a clothing line, even with a family, may add 5 minutes a day of extra work having to put up the clothes, but may well save you some ironing). 5 minutes a day? Unlikely The washing must be put out. Thought must be given to the weather forecast. If your space for a line is limited you will likely need to let a load of wash sit wet while the first half dries. It adds up to hassle and stress for people that often already face a lot of stress. It is unreasonable to expect people to change their habits. Your complaint about motivation cuts both ways. Who are you to judge someone if they choose to reduce their stress by using technology? There are plenty of environmentalists that fall into that category. The 100 mile diet is a perfect example – no thought to a ‘whole lifecycle’ in that book. If it is grown 101 miles away you should not eat it. That is narrative that shows up in the media so it is rather irrelevant that some environmentalists take a more nuanced view. Don’t want to use sustainable energy? Then use less energy (cf hangdry your clothes). Don’t want to hangdry your clothes/use less energy? Then use sustainable energy. Don’t want to do either? Go find another planet. > (a) include factual errors in calculating the costs and benefits of proposed climate change policies, (b) are based upon assumptions in the economic models on which the cost claims are based that ignore other potentially valid assumptions, (c) fail to consider costs that society would bear from inaction on climate change, and (d) include outright falsehoods. Let’s not forget the metaphysical assumptions underlying the economical models themselves. For instance, it’s not unusual to see an assumption that bureaucracies are wrong and that bureaucrats are bad. As if corporations and corporate drones would automagically solve the problem. Communism on paper was a wonderful philosophy – everyone working for common good – no poverty – equality for all. Who could argue with it? It failed miserably because it did not take into account human nature. Any effort to convince people to live with inconvenience because of some need to contribute to the ‘common good’ will fail for the same reason. Sustainable energy is also a fantasy because no matter what energy we use it will have a huge impact on the planet. This is true for wind and solar as well as nuclear, hydro, coal or gas. The only difference is the type of impact. In the case of wind and solar it will be a massive electrical grid that turns country sizes tracts of land and ocean into industrial energy parks. Personally, I think nuclear offers the best trade off. Yes, communism failed because of human nature, certainly not because of international policies of Western countries. Bombing and embargoing are part of human nature, after all. Are you serious? Are you really unaware of the incidious nature of collective ownership that strips away any incentive to work more than one’s peers? Are really unaware that central planning was a miserable failure that lead to the starvation deaths of millions? I could also ask you if you are serious too about appealing to “human nature” as you are doing right now, why “human nature” tops foreign affairs, which is also leading to the starvation deaths of millions, and other kinds of deaths too, and how does this “incentive to work” is being documented outside metaphysical realms. I could also if you are serious about invoking “communism” in the discussion right now, as you were when you seem to be when talking about “environmentalists” and “bureaucrats”. In fact, one could also simply wonder why you’re rehearsing all the usual libertarian talking points. Yes I know about the mercury emissions of coal plants. But because coal plants emit mercury, we should increase mercury release limitless by using CFL? The CFL with reduced mercury you are mentioning are giving very poor results in the sense of start-up time, light quality. But you do not comment on my LED remark. Do a simple calculation: how to store 1 MWh of energy in molten NaCl? Do you have any idea about the amount of NaCl and the temperature you need? You bike to work, I can not simply due to the long distance. As for other things, I do not see an active drive to lessen your energy consumption other than switchting off things in stand-by. The usual stand-by consumption is 1 to 3 W. With 40 appliances in your home at standby, it will amount to 120 W (max). One pump for the circulation of water in your central heating system will be equivalent. The use of a dishwasher will set you back 2 kWh. There is so much money floating around to be harvested. It pays to be “green”. And for the mercury from the CFL holds the quadratic law: it is so much more close to your personal exposure compared to the release of coal fired plants, that the risks of an exploding CFL are probably a thousand fold (or more) more harmful for a single human being in the vicinity of the exploding bulb than the coal released mercury ever can be. It is not a matter of amount, it is concentration that is lethal. Bart suggested a ‘solution’ to a problem which is completely unworkable because it requires people to act against their nature. I pointed out other examples where people proposed ‘solutions’ that failed for the same reason. The most important question to ask when looking at a government policy is the real incentives it creates. Most government policies create incentives than completed undermine the stated objective. For example, the government policy to make mortgage interest deductable simply encourages people to take on more mortgage debt than they can afford and delay paying it off. This policy was one of the major contributors to the economic meltdown. Please try to react to some of the factual information I give. It is original, based on my observations, but nevertheless, it is factual. Not typical, average, or whatsoever. You seem to talk about the mortgage debt deduction, I believe you’re talking about the deduction of the mortgage interests paid during the year, right? And you seem to say that this fiscal incentive is “one of the major contributors to the economic meltdown”, right? It would be like to have a reference for that claim. There is no mention of the fiscal incentive. Nor is there any mention of human nature as a refutation to Greenspan’s philosophy. Federal Deposit Insurance Corporation Chairman Sheila Bair came close to the third rail of tax policies Monday, citing the federal tax deduction for mortgage interest as one of the causes of the nation’s banking crisis. Many people have looked at the differences between the US and Canada where there have been no bank failures and no housing collapse. There are two obvious differences are the mortgage interest deductions and no-recourse loans (i.e. if Canadians walk away from a mortgage the bank can seize other assets to pay for any bank losses because the house is worth less than the mortgage). I realize that many politicians are not interested in talking about about the real reasons for the finacial crisis since beating up on banks wins more votes than asking voters to give up entitlements. In any case, these are good examples of how government policies introduced with the best intensions can have disasterous consequences because of the bad incentives they create. > This crisis is the culmination of a decades-long process where national policies have skewed economic activity, away from savings and toward consumption, away from investment in our industrial base and public infrastructure and toward housing, and away from the real sectors of our economy and toward the financial sector. […] Examples of these policies include federal tax and credit subsidies for housing, a tax code that can unduly favor short-term profit, and implied government backstops for financial firms that have now, in many cases, been made explicit. It would now be interesting to have some numbers, if only to be able to say if Bair isn’t simply using the crisis to coatrack a pet subject. In reality, the argument amounts to say that it would have been wiser to raise the interest rates. Since Canadians pay more taxes than Americans, and because most of the canadian economy relies on the american one, I believe the effect of these kinds of incentives should also be observable in Canada. There are no tax deductions for mortgages in Canada. The CCA does not apply on one’s own residence because Canadians do not pay tax capital gains from their primary residence. I first heard about this in a report issued by a Canadian financial company (unfortunately not online anymore) so the connection between the crisis and the MID in the US and the financial crisis not simply political opportunism. There are people in finance who think it is a more plausible explaination than regulatory failure. Canadians used pay more taxes than Americans. That has changed but the exact comparison really depends on the state/province. The difference is even more appearent when you consider that basic health insurance is paid out of tax revenues. The MID in the US has zero effect on Canadian decisions about taking on debt no matter how much trade Canada does with the US. It is that kind of insufferable, holier-than-thou attitude that has led to the current belief that a tiny trace gas, comprising only 0.00039 of the atmosphere, is the primary driver of climate change. Nonsense. The effect of CO2 is minuscule, as can be clearly seen in the lack of correlation between temperature and CO2 on any time scale. Further, rises in CO2 follow rises in Temperature; effect can not precede cause. Rising temperature causes rising CO2. That is an empirically verifiable fact. Taxing the air we breathe has been the Holy Grail of governments since the beginning of human history. please read the entire thread. You are jumping to conclusions. > There are no tax deductions for mortgages in Canada. dismisses the fact that owners can deduct the interest paid for the spaces they rent, i.e. a revenue. As long as you buy a duplex house you profit from it. > An indirect method for making interest on mortgage for personal residence tax deductible in Canada is through an asset swap, whereby the homebuyer sells his existing investments, purchases a house in full or in part by the sale, gets a mortage on the house, and finally, buys back his investments with the money from the mortage. That said, I agree that this might not be widespread a trick. > First, the taxpayer must elect to itemize deductions, and the total itemized deductions exceed the standard deduction (otherwise, itemization would not reduce tax). Second, the deduction is limited to interest on debts secured by a principal residence or a second home. Third, interest is only deductible on up to $1 million of debt used to acquire, construct, or substantially improve the residence, or on up to $100,000 of home equity debt regardless of the purpose or use of the loan. What we would need, here, is a description of how people can make loads of money using this deduction. > it does not significantly impact home ownership, that it allows taxpayers to circumvent the general rule that interest on personal loans is not deductible, and that the deduction disproportionately favors high-income earners. We already covered the second one. The first and the third one are very strong arguments indeed for the removal of that incentive. But what Sheila Bair says does not exactly corroborate those who think that this mortgage tax deduction is a more plausible explanation than regulatory failure, whatever that means. Hence the need for an holistic approach, as she recommends. There is no reason to cherry-pick that one up at the expense of the other causes. The vast majority of Canadians homes are owned by people who live in them so commercial use is not a factor. The debt swap scheme is rarely used because you have to have enough assets to but your house outright. They do not get any subsidies from the government for this and, as a result, Canadians carry a lot less debt on their homes than Americans. The facts actually speak for themselves since the wiki article points out that the average Canadian carries a mortgage of 30% of the home price vs 55% for Americans. That difference is huge and a direct result of the MID which encourages Americans to take on more mortgage debt. When the economy goes bad people with more debt are more likely to default. But the MID is not the only factor. Another one are the no-recourse loans. In the US if your mortgage is worth more than your house you can walk away and keep all of your other assets. Your credit rating takes a hit but that comes back. In Canada people do not have that option. If they walk away they are still on the hook for that mortgage and their only option is bankruptcy. The no recourse loans give people an incentive to defaultin the US which hits banks hard. This problem is aggravated by a system that makes it difficult to repossess homes in the US. In Canada if you stop paying your mortgage you will be on the street within three months unless you can cut a deal with the bank. In the US you can live in your home for a year or more for free. The bottom line is unintended incentives matter. harry thats no answer. what Rocky S said is true. I think you need a different chart, to get a handle on the problem. Add in a few more emission scenarios, with strong emissions reductions taking effect in 10,20,30,40,50 years. How fast do these lines approach the top line? This is the cost of inaction. Discussions about mortgages is clearly of topic. Please move it elsewhere. I am waiting for your answer to the mercury question? Any idea yet? Local poisoning of the environment by heavy metals like mercury is notoriously difficult to handle. In a professional setting, one needs to have have special mercury spill-kits around. No one has these in a household setting. I do. Because I know how dangerous mercury is to the health of my children. That is also why I do not have CFL in the bedrooms of the children. They have incandescent bulbs, which I harvested before they were outlawed. It looks silly, but do the math and you will discover the truth. Harry, I was away for a while. Anyway, I guess you don’t care that the whole environment is now exposed to more mercury than if you had used CFLs. If a CFL breaks, you don’t get all the mercury just released at once. It takes a very long time, more than enough time for you to put the broken bulb in a glas jar. In the meantime, your kids may be eating canned tuna thus ingesting the same amount of mercury (or more) you prevented entering their bodies if, and only if, a CFL bulb broke in their room. I did the math: 200 gram of tuna easily gives you 20 microgram of ingested mercury (depending on brand it may actually be more), about the same you’d inhale if a CFL broke and you were unable to remove the whole spill. Most of the mercury in a CFL is in vapour phase. It is released as vapour the moment the bulb breaks. Only in cold conditions (when the CFL needs considerable time to start) the mercury is not in vapour. The rest of the mercury will adhere to the carpet, whatever in the room and be released during the next days. This will result in several times more than the 20 micrograms in the tuna. And good quality canned tuna does not contain detectable levels of mercury. (FDA 2002). The CFL that fail, often do this quite catastrofically, involving the burning of several electronic components, such as rectifiers, capacitors and transistors. All these components can emit dangerous fumes when failing, and they can be smelled days after they failed, due to the emission of toxic fumes. And not all coal are equally polluting. And an incandescent bulb does contain zero mercury. However you think about it, replacing incandescents with CFL adds a significant risk. Harry, did it change your mind? Did it change what you do? Harry, even if all that mercury evaporates at once (no, it is NOT all in the vapor state), in a medium-sized bedroom you rapidly get below the 0.025 mg/m3, which is the OSHE’s TLV-TWA, with a little bit of ventilation. And while not all coal are equally polluting, the numbers I used were based on averages. that depends on the temperature as you surely know. But for mercury, I assumed a very low amount of mercury per bulb (1 mg). Wikipedia learned me that the level would be be 3 to 10 mg/bulb. Wikipedia also learned me that the contribution of mercury due to content of incandescant bulbs is zero. That makes the contribution of CFl to the total mercury burden more pressing, since the bulb is the primary cause of failure, inducing secondary failures in the electronics, resulting in the release of toxic fumes from burnt components and printed circuits. If mercury is so easily vented down, why do I have to have special mercury spill kits at my laboratory? Opening the windows will do???? you should go back to your basics, read the rules and stop blathering. CFLs kill as well. But nobody notices. The most obvious symptom of mercury poisoning: incomprehensible mental functioning due to nervous system intoxications. Harry, Wikipedia is wrong. The EU has capped it to 3 mg/bulb, the US allows up to 6 mg/bulb, in special cases. Of course, when the electronics fail, no mercury is released at all. Regarding mercury spill kits in laboratories: there usually is quite a bit more mercury in a lab. For example, the average mercury thermometer contains about 3 grams, a factor 1000 more than a CFL. And then there’s the “rules”. We also have to have all kinds of firefighting equipment in our labs, while we do not have to have that in our homes. You are very well informed, thank you for pointing out the Wikipedia errors. But as for lab rules, you are not up to date. All mercury thermometers have been banned in the labs. However, CFL are a risk for spreading mercury, and that risk does not compare to the benefit of having a lower CO2 footprint compared to an incandescent bulb, in my humble opinion. Especially when one considers the low amount of energy that is used for domestic lights, which is less than 1 % of our total use of electric power. Interesting site, nice calculations, but not on topic. The mercury released by the coal fired powerplants is diffuse and will be readily be absorbed by the environment, mostly exposed bare metals and sulfur containing organic components. The mercury released by a broken CFL is locally at very high concentrations (atmospheric saturation, depending upon the air temperature). Thus it will cause very high local concentrations which are never achieved by the coal released mercury. Since exposure to mercury, especially high concentrations, is irreversible, I prefer not to have CFLs. Feel free to think otherwise. Harry, maybe they are in the Netherlands, of which I do not know the regulations, but not where I work (also an EU country). Several countries in the EU have banned the sales of NEW mercury-in-glass thermometers, but have not banned the use of those already on the market. Being part of our local Occupational Health and Safety Organisation I have not seen a single document from our government that we must remove mercury thermometers. I did the search in the documentation, nothing there. Another small indication that it isn’t banned in laboratories: several EU-based companies still sell mercury thermometers for use in the lab, which includes Brannan. Regarding the carbon footprint: many small things make a big contribution. If we take the “it’s just a small contribution” argument for everything, nothing will happen. It would be about time your country implemented these rules. Harry, there is NOTHING in that document that states mercury-containing thermometers cannot be sold. It notes “restrict”, which is enormously different from “prohibit”. Note amongst others point 3, which contains the important “only the general public” (paraphrased), and point 6, which points to a requirement to first determine whether proper alternatives are available. Point 7 is also relevant in that any and all restrictions discussed in the directive only apply to new equipment. I can not but pay my respect to you for elaborating on the mercury case. You must be very capable in the labyrinth of the beaurocracy. Please consider moving into the Netherlands. You will find a fertile feeding ground for people who are knowledgeable in environmental issues. Proud daddy pic makes we wonder whether parenthood is a predictor for peoples’ stance on emission reductions. That is a question climate-sociologists seem to shy away from.